The Bentley Mulsanne is the reigning king of the ultimate luxo-barges, at least until Rolls-Royce decides to replace the Phantom. Part of being the king is being exclusive, and how can you ensure you keep your crown? That's right – you make it exclusiver. Only 22 Bentley Birkin Mulsannes will be made, and even then, only for European customers (though don't color me surprised if one finds its way to Dubai, and another to China). 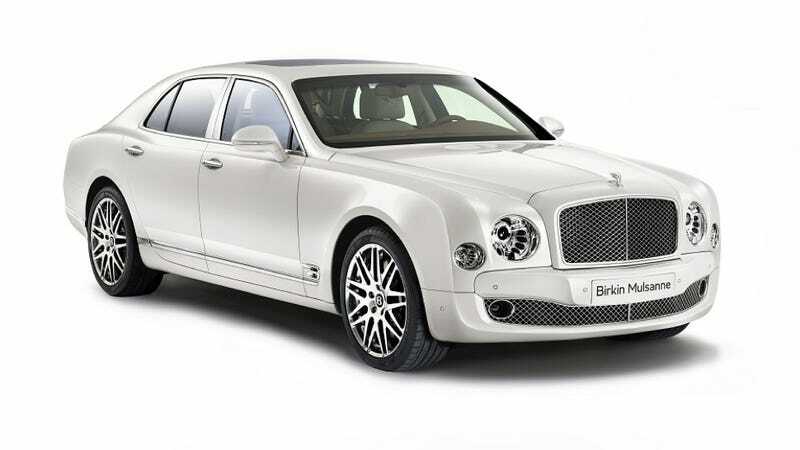 Named after "Bentley Boy" Sir Henry "Tiger" Ralph Stanley "Tim" Birkin, 3rd Baronet, the Birkin Mulsanne will feature special wheels, special colors, TVs in the back, iPads in the back, a DVD player in the back, WiFi in the back, and many other things in the back besides, the "Bentley Mulsanne embodies the essence of Birkin's beliefs as a motoring connoisseur," according to Bentley. And yes, Sir Henry "Tiger" Ralph Stanley "Tim" Birkin, 3rd Baronet, is the guy's real name. He died after the Tripoli Grand Prix from burns that led to sepsis or from malaria or from both, nobody's really sure, because it was the 1930s and people just died back then. The Birkin Mulsanne comes in Ghost White, a lovely shade of blue, and "Damson," which I had to look up, but apparently it's this gorgeous shade of purple. So. First Europe gets awesome beer, then it gets awesome food, and now it's got awesome Bentleys. If anybody's got an EU passport they're willing to throw me, just give a holler.